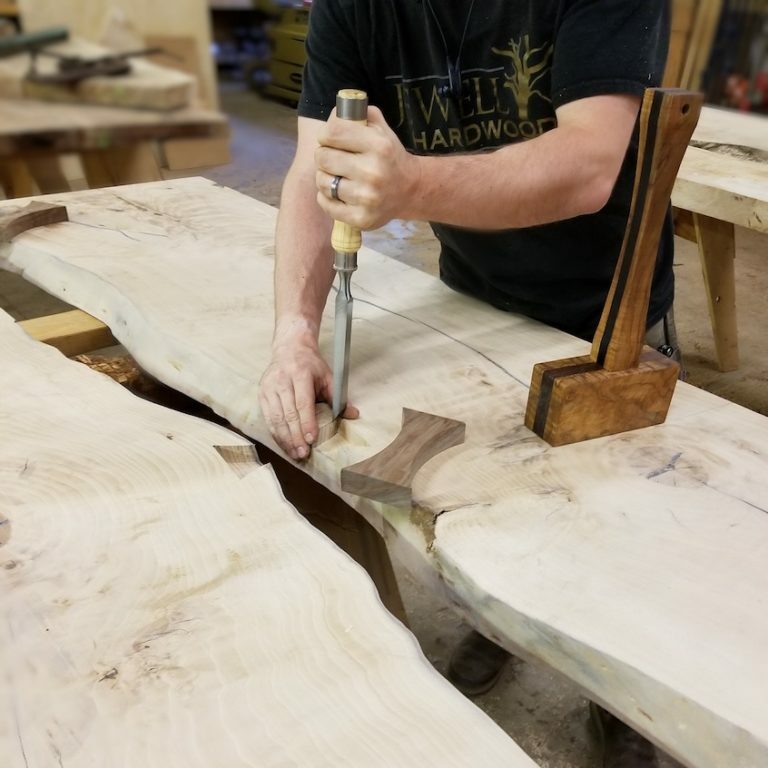 At Jewell Hardwoods, we create furniture differently - From the Tree to Fine Finished Furniture. In order to build furniture of the highest quality, we start with select hardwood trees. Our trees come from local urban areas where they need to be reclaimed. We bring the logs back to our property where they are milled and then dried for at least 2 years. When you contact us, your experience begins by personally working with one of our designers. We are able to offer our clients an exclusive selection of slabs to bring your inspirations to life. The most exiting thing for us is watching a client fall in love with the piece they have been dreaming of. Click on our Finished Furniture Galleries to see past designs we have created. We are located just outside Portland Oregon and can serve you at our Showroom, over the phone or via email. Not located in Oregon? No problem. We frequently send our furniture to clients all over North America. In the Northwest we are known for our beautiful large trees. Our wet climate and ideal soil conditions are prefect growing conditions, especially for black walnut. The challenge comes in drying these large slabs so that they are flat with minimal defect. Many companies take short cuts on the drying process to speed up their turn-over rate leaving their product susceptible to twisting. For Jewell Hardwoods, these short cuts are out of the question! 1) Urban recovered trees which are personally selected after considering the health of the tree, its size and the quality of wood. Trees are generally selected because of declining health of the tree, construction or overcrowding of urban environments. 2) We mill all trees into our quality hardwood slabs right on our property using three different sawmills. 3) To prevent rot and uneven drying, we properly stack each slab based on species and size, and always with proper sticker spacing. 4) The slabs are stacked on flat concrete and under a covered metal roof. This ensures that the slabs stay straight as they slowly air dry before the kiln process. 5) Each slab is air-dried for 18-24 months, which insures a low moisture content before the final drying step begins. 6) The most crucial stage is kiln drying. We have found that kiln drying hot and fast without properly monitoring the moisture content of the wood results in twisted slab. We believe and have proven that drying quality hardwood slabs take time. We will not hurry a slab through our kiln cycle to appease a deadline. Quality is always worth the time. 7) When we take our slabs out of the kiln we surface them to reveal the beauty and character of each piece. At this point the slab is brought into the showroom and is ready to be turned into custom furniture. 8) Once you have found your perfect slab our craftsmen get to work. From precisely cut bowties to expert joinery, we specialize in going well beyond simple slab construction. Our artisans can also incorporate glass, steel and stone into our projects to allow diversity to our designs. For example, our "Bridges Collection" incorporates precisely cut glass to follow the live edge and mimic the flow of a river. In contrast to mainstream manufacturers, our solid slab furniture highlights the beauty that nature created. We work with the natural imperfections to handcraft functional pieces of art. 9) For our finish we are proud to use one of the industry's highest quality brand of Clear Acrylic Polyurethane. This finish is harder and more durable than conversion varnish, water resistant, UV resistant and formaldehyde free. Our finish will not blush or leave cup rings even if left exposed overnight. Our projects even stand up to the high use environments of commercial restaurants. You reap the rewards of our high standards! 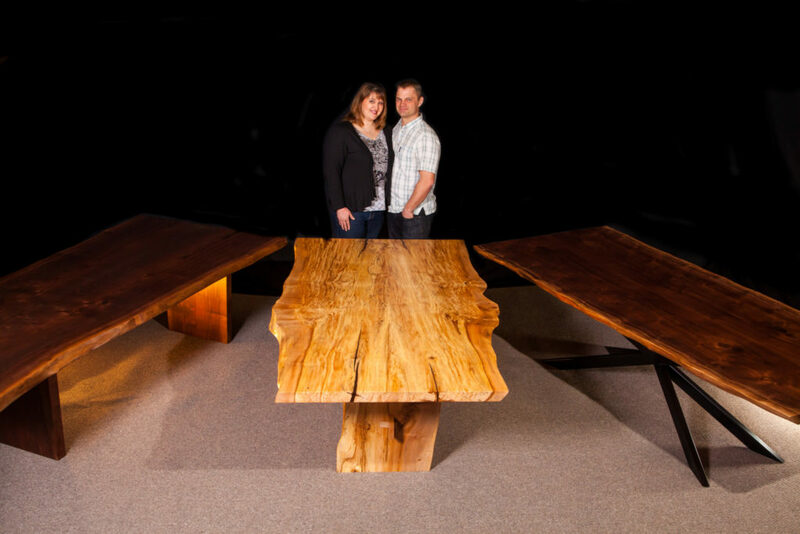 Our tree-to-finished-table process is what sets Jewell Hardwoods apart in “quality control”. We know exactly where our wood comes from and how it is dried. That is how we can stand behind the quality of every single slab we sell. How many furniture makers can do that for you? We look forward to placing our quality furniture into your hands.